I barely had time to learn my way around before the Conqueror's army broke camp and left Chalcidice. We headed west through Macedonia and then south through Epirus, territory already held by General Xena. For several weeks, the army was constantly on the move. During the day, the Conqueror rode at the head of the army and I stayed in the rear with the support units. I didn't get to spend much time with her until we reached the southern border of Epirus and Thessalia. There, the army set up an encampment. It felt good to stay in one place for a while. That's when I got to know the charismatic warrior, whose self-proclaimed destiny was to conqueror all of Greece. Xena and her senior officers began to plan their battle strategy for the Thessalian campaign. It was my job to take notes during these meetings. Their first objective was Ambracia, a small kingdom west of Thessalia and the Pindus Mountain Range. From what was said at these meetings, Ambracia was not considered strategically important. Having no experience in such matters, I was keen to learn all I could. I studied the maps. I listened intently to Xena and Commander Darnell debate battle tactics. And I had my first lesson in the high stakes game of politics when the King of Ambracia came to negotiate a treaty. With quill and parchment ready, I had taken my position behind the Conqueror, who remained seated as King Quallas entered the command tent. "General Xena, I have come to save you the time and trouble of conquering my small, insignificant kingdom"
"Oh, it's no trouble, King Quallas," Xena said as though the king had asked her for a favour. The king offered to pay a yearly tribute of fifty thousand dinars, and he offered her a large green gemstone. I didn't get a good look at it from where I was sitting, but the king said it was a priceless jewel with some kind of magical powers. When she refused, he offered to raise his tribute to sixty thousand dinars a year, plus the stone, plus the servant. "Very well, I accept your tribute," said Xena simply. As I wrote her words, I felt hopeful that this would be settled without bloodshed. "Does that mean you will not invade Ambracia?" King Quallas asked. I nearly jumped off my stool when the Conqueror suddenly slammed her dagger into the arm of her chair. It had the desired affect of rattling the king and everyone else in the tent as well. "No, that means I will take your wealth, your lands, and your life." With that, my hope for a peaceful solution crumbled. I knew Xena was in the business of war and that fighting was inevitable, even necessary at times, but I believed if war could be avoided then that was always the better option. General Xena turned to her second-in-command. "Commander Darnell, have the army assembled before first light. I want this worthless plot of land under my banner by this time tomorrow." "Guards, take him away. I want his public execution to crown our victory celebration." "Uhh." I reacted before I could stop myself. Everyone in the room heard that tiny gasp, and the Conqueror shot me a stern look. I quickly lowered my eyes and went back to writing as the king was led away. "Now leave me, all of you." I started to leave with the others when Xena called me back. "No, Gabrielle, you stay." My stomach clenched and my feet turned to lead. I didn't know which was worse, facing the Conqueror's wrath or returning to Potidaea in disgrace. I turned and faced General Xena. Her usually soft blue eyes were hard and I could see her right hand clenching and unclenching. Suddenly I was twelve again, when I felt the sting of my father's switch for talking back to him in front of guests. I felt nauseous at the prospect of what kind of punishment the Conqueror would mete out. "Gabrielle, never express your feelings in the presence of others again. Do you understand?" The tall and intimidating woman scolded me with barely controlled anger. "Yes, General. I'm very sorry." I stood with my eyes cast downward, waiting for the worst, dreading what "the worst" might be. Xena's whole demeanour abruptly softened. "Pour me a glass of wine...please." I was nonplussed. Not only did her unexpected change in mood surprise me, but to my knowledge, Xena never said "please" to anyone. Her request finally registered and I managed to move my trembling legs in the direction of the side table. "Uh... yes, General." I poured her a goblet of wine and brought it to her. "Thank you," she said as she took a sip. I was still trying to sort out Xena's disarming change in mood, when she surprised me again. "You disapprove of my orders to take Ambracia. Why?" "It is not my place to say, General," I demurred. "I asked for your opinion. You may speak freely." I clasped my hands in front of me and cast my gaze to the floor. "You had an opportunity to take Ambracia without bloodshed. Instead you've ordered the king executed and your army into battle. Why sacrifice your men when you can achieve your objective without fighting?" The words came out in a rush and I tensed, expecting a stern reply. "I'm a soldier and the men out there are an army. It's what we do." She offered her explanation with a calm finality as if there was no other option. I looked up at her, there was no emotion showing on her face, so I extended my argument. "But the outcome will be the same. Only your way will cost lives." "What do you know about the cost?" she snapped. Like a pendulum, Xena's mood had swung from angry to amiable to tetchy, which took me aback. She had asked me for my opinion, so I answered her honestly, and for that I was rebuked. I wasn't sure what to do or say next. I was still learning how to anticipate her moods. I think she felt badly for losing her temper, but she didn't say anything about it. She just changed the subject again, and her mood changed with it. She asked me if I knew anything of the gem that King Quallas had brought. "You're something of a bard. I was wondering if you had heard any stories about a green gemstone with mystical powers." "No. I've heard of the Jewel of Demeter, but nothing about a green stone." "It's probably just a silly story designed to make it appear more valuable than it actually is. I think I'll have it fitted to the end of a sceptre. What do you think?" "It's only a green stone, what does it matter what you do with it?" I realized it must have been worth a king's ransom, but to me it was just a bilious-coloured green stone. I was just being honest. This time, my honesty was met with more surprise than anger, and we went on to another topic. Xena was a study in contradictions: in public she was demanding and quick-tempered, yet in private she was more considerate and patient. In essence, there were two Xena the Conquerors: one commanding, the other captivating. Neither was as I expected, and I wanted to get to know both sides of this complex and enigmatic woman. Xena entered the tent and sat in a chair, dropping her sword and scabbard to the ground. Her army had just routed the Ambracians. She was tired, and sweaty, and splattered in blood — none of it her own. I moved quickly to help with her armour. As usual, she tensed slightly when I first touched her, but she soon relaxed. She was coming down from the adrenaline rush of fighting and was still aggressive and ready to strike. I'd learned it was better to be patient and wait for the rush to wear off before engaging the Conqueror in conversation. I made the mistake once, and that was enough; she had shouted at me to stop my "senseless prattling". I immediately ceased what I was doing and poured a goblet of water. The water was downed in a couple of gulps. "More," she commanded, handing me the goblet. I handed her a refill. For a moment, I was lost in the crystal-blue eyes that looked up at me as the goblet exchanged hands. I never before noticed how intense they were, and stood frozen in place, as if hypnotised by a predator's gaze. "Quit daydreaming and help me get out of these." "Sorry, General. Please forgive me." I rushed to loosen the bindings on her armour, while silently admonishing myself for being distracted. "It's — Ow!" I pulled away quickly. A thin red line appeared on the back of my hand where it caught the edge of her chakram. Long, supple fingers gently but firmly gripped my wounded hand. "It's only a scratch, General," I protested, as Xena held my hand up to examine the wound more closely. "Hmmm. I'd better clean it for you." She pulled me over to a chest and pulled out a phial. "This will sting a bit," she warned. Determined to be stoic, I tensed and prepared for some slight discomfort. She poured a few drops of the liquid onto my cut. "Isth!" I sucked in air through clenched teeth. I couldn't keep quiet any longer. It hurt too much. "That stung a lot, not a bit." "I know." She chuckled. "If I told you it would sting a lot, you wouldn't have let me put it on." In no time at all, only a slight twinge remained as she rubbed the liquid into the wound. It seemed ironic to me that these hands could kill with little effort, and yet these same hands could so soothingly minister to my cut. As her thumbs tenderly stroked the back of my hand, I felt no pain... but an indescribable ache. I closed my eyes to shut out all but the electrifying sensation her feather-like touch set off underneath my skin. My reason returned once I realised she had stopped stroking my hand. When I opened my eyes again, her soft blue eyes met them and held my gaze. And, for a moment I forgot where I was — and with whom. "Ahem." A servant stood on other side of the tent flap and cleared his throat. "Uh, thank you, General," I said, as we quickly pulled our hands away like children caught sneaking a piece of just baked nutbread. "Enter!" General Xena barked, annoyed at the interruption. "Your bath water is ready, General," the servant said as soon as he stepped inside the tent. "Very good. Bring it in," she commanded, and the servant scampered away to fetch the buckets. My hands trembled as I carefully removed the rest of General Xena's armour. I was hoping she didn't notice the lingering flush in my cheeks. When I had finished, she turned to face me. A gentle smile completed the transition from imposing warrior to striking woman. "Gabrielle, I want you to go rest that hand. I'll see you in the morning." Her voice was kind and friendly and made me feel warm and protected. I left reluctantly, disappointed that she had dismissed me early. 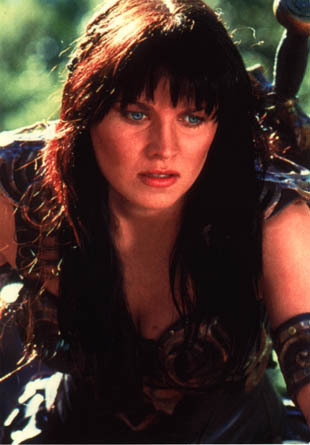 I felt drawn to her, and wanted to stay and get to know this side of Xena better. The other side of her personality was demonstrated a couple of nights before the fall of Larissa. I knew the Conqueror dealt harshly with her enemies, but I never realised just how merciless she could be until the day Lieutenant Galates' unit captured a young Thessalian. It was past sunset, and Xena was meeting with her commanders. Now that the poisoned grain had weakened the Thessalian defences, it was time to plan their strategy for capturing their capital, Larissa. As usual, I was there to take notes and pour the wine. I had done more of the latter. A messenger interrupted the meeting to report that a unit of Lieutenant Galates' Fourth Perimeter Guards had captured a spy. Galates left in order to investigate. Everyone followed, including Commander Darnell and the Conqueror, hoping this spy would have valuable information that could help us defeat the Thessalians. Being jostled along by the soldiers was a young man with his hands tied behind him. He was unceremoniously dumped on the ground when the formation came to a halt. Lieutenant Galates scowled at his men for their rough treatment of the prisoner and helped the boy to his feet. The officer-in-charge saluted. "Sir, my men found this Thessalian spy trying to infiltrate the forward perimeter. I brought him directly to you. I knew you would want to interrogate him yourself. He was alone and unarmed, but had these on him when he was captured." The officer thrust forward two parchments: one rolled up and the other folded. Galates took the documents and ordered his men to return to their post. Galates read the parchments, and then handed them to Commander Darnell, who read them. He, in turn, handed them to General Xena, and she read them too. The documents turned out to be a letter of introduction to the Commander of the Thessalian Palace Guard and a map of the city of Larissa. The Conqueror fixed her look on the prisoner, who grew paler as she stalked around him. "What were you doing near my army's perimeter?" she demanded. The young Thessalian either didn't understand the question or was too frightened to answer. "I asked a question!" She punctuated it by backhanding him. Before he could recover from the vicious slap, she kicked the prisoner in the back of his knees. He fell to the ground kicking up a small cloud of dust. "Please!" the young captive cried. "Don't hurt me! "Hurt you? By the time I'm finished with you, you will be begging for me to kill you." The Conqueror placed her foot on the boy's neck and ground in her heel. Looking around at the gathering crowd, General Xena then said, "It looks like Thessalia is now sending their children to spy on us!" Tears started pouring down his cheeks as General Xena hauled him to his feet. "I'm not a spy, I swear it!" "Then what is this, your mother's laundry list?" The corners of her mouth curled into a sneer as she waved the parchments under his nose. The officers and soldiers, who had gathered around, laughed and taunted the prisoner. "N-no, General, a letter of introduction from my father and a map of the city so I could find my way to the palace." "Yes, a letter of introduction to the Commander of the Thessalian Royal Guards. So, you want to join the Thessalian Royal Guards, do you?" "I..." The pitiable young man seemed at a loss how to answer. "You're a soldier in the Thessalian army — that makes you my enemy. And you were captured in civilian clothing carrying a map — that makes you a spy." The Conqueror leaned in and asked the prisoner in a malevolent whisper. "Do you know what we do with spies, eh?" "Chain him up!" Xena ordered as she threw the prisoner at the soldiers. "Have him interrogated, Commander Darnell, slowly and painfully. We'll crucify him outside the city walls tomorrow. I want to send a message to the Thessalians…"
As the pleading boy was led away, Xena finished her comment, "…never send a boy to do a man's job." With that, she returned to the command tent. These were the times I questioned why I remained with Xena. I understood that war was a dangerous, vile, destructive business: it reduced man to his baser instincts of kill or be killed. But the captive was just a boy, no more than fifteen summers old. He was no spy. Lieutenant Galates and I knew it, Commander Darnell knew it, and the Conqueror knew it. The crowd dispersed until only Galates and I remained. We didn't speak. What could we say? That it sickened us to see Xena take such delight in tormenting a boy? That we were cowards for not speaking out? That the boy was just another casualty of war? As Galates and I stood there, our eyes silently acknowledged we had an ally in one another. Galates and I both jumped when Xena called out my name. "Gabrielle!" she called once more, this time sounding impatient. I offered the lieutenant a weak smile and rushed to the Conqueror's tent. "What kept you?" The Conqueror snapped at me as I entered the tent. I scanned the room and found Xena seated at her desk trying to drain an empty wineskin into a goblet. This was the same wineskin I had left half-full on the serving table just before the Thessalian boy was brought before her. "Forgive me, General, I didn't mean to keep you waiting." "More wine." She held up the empty wineskin. I retrieved another wineskin and filled the goblet in her outstretched hand. She looked at me over the rim of the goblet. "What's wrong?" she asked as she held it out for another refill. "I thought you were a bit harsh on that boy," I said tentatively. "He was a spy," she countered. "He was just a b—"
"Spy!" she interrupted and glowered at me in a challenge to contradict her. "Yes, General," I backed down. In her drunken state I couldn't be sure that Xena wouldn't hurt me. "What took you so long to get back here?" she grumbled. "I was talking with Lieutenant Galates." "What's with you and Lieutenant Galates?" She gulped down another goblet of wine. "Nothing, General." Her question caught me by surprise. I didn't know what she meant. Did she suspect Lieutenant Galates and me of plotting against her or something? "I saw the way he looked at you — the way all the men look at you." The dinar finally dropped. She was asking if there was a sexual attraction between the lieutenant and me. Nothing could be further from the truth. "I assure you, General, I've never...would never…"
"Don't tell me my personal assistant is a virgin?" If someone could die of embarrassment, I would've expired on the spot. My cheeks blushed hot enough to melt ice. Humiliation turned to dread when the Conqueror stood and approached. "Perhaps you'd like a little 'education'," she whispered in my ear as she neared me. I had little experience in such matters, but there was no mistaking the lustful look in her penetrating blue eyes. Before I could react, two strong hands grabbed my arms and pushed me back against the table. Goblets, plates, and fruit clattered to the floor behind me, but I was so focused on what was happening, I barely registered the din. "Gen—" My protests were cut off as Xena kissed me hard — her lips crushing mine, her tongue forcing its way past my lips and filling my mouth — exploring, capturing, conquering. She smelled of wine, and sweat, and leather — an intoxicating combination that left me weak. I tried to push her away, but it was useless. She was too strong and too determined. Any strength I had quickly drained away. I wanted to scream, to plead with her, but I couldn't do either. My heart was pounding. I couldn't breathe. I was terrified that she wasn't going to stop. Silently, I prayed to the gods not to let it happen this way, but then I was shocked at my desire to have it happen at all. Suddenly, she broke off the kiss and released her hold on me. I didn't know what I should do. Run? Stay? I was stunned. "You may go," she said quietly and moved away. "Yes, General," I managed to say and hastily retreated. As I left the tent, I glanced behind and saw the Conqueror pick up a goblet from the ground and pour more wine. Once outside in the cool night air, I paused to catch my breath, steady my nerves, and sort out what had just happened. I was reeling from all the questions that flooded my mind. Why did she kiss me like that? Did I do something to cause it? Why did my body react to her touch? What made her stop? Could she really be the warrior I was meant to follow? What should I do? Common sense was telling me to pack my belongings and get as far away from this volatile woman as I could. Yet, like a moth to a flame, I felt attracted to her. And despite how inexcusable her actions had just been, my inner voice was telling me to stay — that this was where I belonged.